Glasslight Studio is owned and operated by myself Mary Carol Law. I live and work in the United States in Maine and Florida. I have been interested in the glass arts since 2006 and full time in Lampworking since 2010. 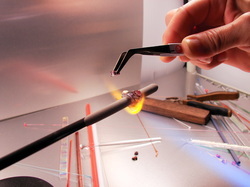 Lampworking is a technique of free forming tiny glass color rods with each other and knowing how much heat and manipulation you can apply before the colors start to blend in with each other. I sell my work on Etsy and through my website. At this time I do not make special orders. On Pinterest or Facebook ? - You can follow me by clicking on the P (Pinterest) or F (Facebook) symbol on the top right corner of my website. Be sure to follow me to receive up to the minute posts on my listings as I update to both sites when I have something new. I currently live in Pensacola, Florida and will eventually be sharing my time between Florida in the winter and Maine during the summers. 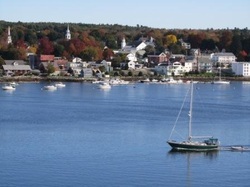 I lived in Maine for 20 years in Milbridge and a wonderful small town called Bucksport. Bucksport is a historic town across the Penobscot River from Fort Knox and the Penobscot Narrows Bridge, which replaced the Waldo-Hancock Bridge. 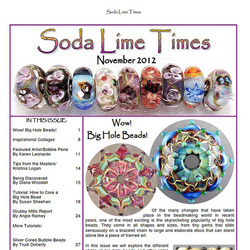 Soda Lime Times featured a strand of my beads in their November 2012 issue as the masthead picture for the publication and a writeup on my big hole beads can be found on page 6 and 7 . 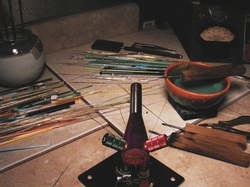 If you are interested in lampworking here is a link where you can sign up for a free copy. I highly recommend this publication as you receive alot of free tutorials and how tos for your money. We are a group of glass artists who are dedicated to the art of lampworking, an ancient art form that flourished in Italy in the 1300s and then spread throughout Europe, the Americas and the rest of the world.We work at home in our own studios, making beads, marbles or other glass objects one at a time. Patiently and carefully we strive for perfection in every object that we make. We are from the USA, Canada, Australia, New Zealand, the UK, Israel, Germany... all over the world! Click on the SRA Flame picture to learn more about this organization. Our deepest fear is not that we are inadequate. Our deepest fear is that we are powerful beyond measure. It is our light, not our darkness that most frightens us. We ask ourselves, who am I to be brilliant, gorgeous, talented, fabulous? Actually, who are you not to be? You are a child of God. Your playing small does not serve the world. There's nothing enlightened about shrinking so that other people won't feel insecure around you. We are all meant to shine, as children do. We were born to make manifest the glory of God that is within us. It's not just in some of us; it's in everyone. And as we let our own light shine, we unconsciously give other people permission to do the same. As we're liberated from our own fear, our presence automatically liberates others. How do you paint the images? Well they're not exactly painted on, they are melted in glass and the designs are built on with layer after layer of hot molten glass melted in at around 1200 to 1600 fahrenheit with a propane oxygen combination torch. The designs are inside the glass and encased with a crystal clear glass to give them depth and clarity. Murrini - Little intricate chips of glass that take many hours and alot of skill to make that depict images and designs that would be totally impossible to insert into glass any other way. I currently purchase my murrini from other very talented glass artisans and occasionally make some of my own but making murrini is time consuming. Why Kiln Anneal? 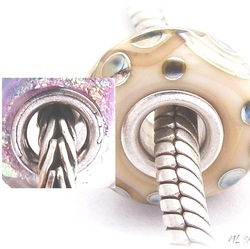 Any Lampworker who sells their beads must Kiln Anneal their beads right after they are finished making them. Annealing is simply a process whereby the beads are slowly cooled at a predetermined time/temperature to relieve any stress in the glass. This prevents them from cracking. 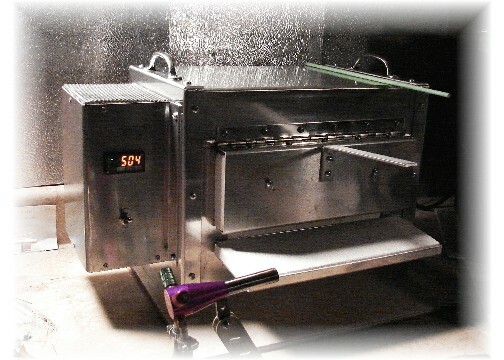 Some kilns are digitally programmed and automatically anneal the beads all by itself and some kilns are manually controlled by the lampworker the old fashioned way with timer and temperature knob (called babysitting the kiln). Kiln annealing takes around 7 to 8 hours a day depending on the size of the glass being annealed. 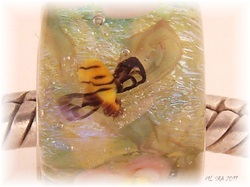 I currently use a Glass Hive Kiln which has a digital controller. I used an older kiln for years and spent alot of time babysitting my beads in the beginning of my lampwork career so I have used both methods. Below is a picture of my Glass Hive "Short Guy" kiln and G.T.T. Cricket torch. My sterling cores are cut from 12 inch sterling silver tubing for each beads custom size. I cut polish and flare all my beads cores myself. This picture shows how just a bit of extra effort with polishing and finishing the cores make for a profession, perfect bead.